Shumway grew up sharing campfires with a colorful host of characters he affectionately refers to as "river rats." 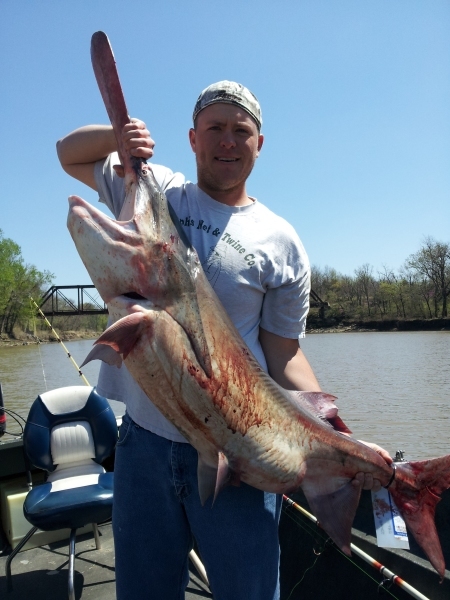 His father owned Shumway Bait and Tackle in north Topeka, Kansas, only a block-and-a-half away from the river. He's a self-depreciating guy, one who claims he "sat on a bucket for 15 years before realizing it needed some foam on the lid." Don't let him fool you, Shumway's demeanor belies an incredibly intimate understanding of all things river-related. 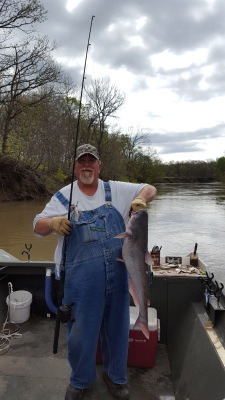 From river habitat to river inhabitants, his insights and instincts collectively rival anything I have unearthed in a lifetime of writing about fishing and those who love it. Cat Daddy Shumway definitely loves fishing. 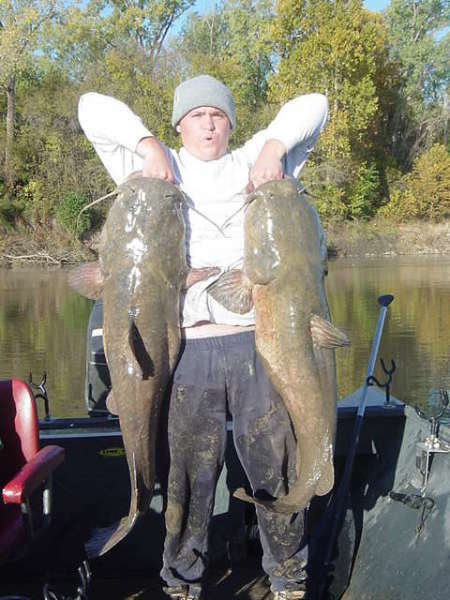 What's not to love, when you can read the waters of a river system and locate trophy- caliber flathead catfish with a systematic regularity that not only defies belief but also provides an income? "You have to be willing to get out there every week," Shumway reminds me. "None of this happens without practice... a whole lot of practice." To that end, the energetic river guide estimates he spends in excess of 150 days a year probing the shores, oxbows and eddies of some of the country's finest yellow cat waters. A video he sent me prior to our interview alleviates any doubt. Fishing with a couple of Billings, Montana-based firefighters, field-testing XL Black Salty baitfish (with an assist from his sons, Brandon "Big Fish" Shumway and Jordan Scott "Cat Daddy, Jr." Shumway) during one of the guide's popular "Old-Style River Camping Adventures" Team Cat Daddy brought aboard a two-day haul of heavyweight flatheads that... well, again, seeing made believing much, much easier. The largest of the fish, taken near the debris-cluttered base of a heavily traveled concrete bridge, bent the scales to 87 pounds. A dense and drifting gauze of early-morning fog cloaks the big man in grayish haze, but the immensity of the catfish is both clear and stunning. On the same trip, the group caught perhaps a dozen other flatheads between 40 and 70 pounds, and more than enough "eaters" to keep the firemen's bellies full for months. To his credit, and no doubt to the benefit of his business, Shumway doesn't keep trophy-caliber flatheads. A true conservationist, one who has caught and re-caught unnumerable gargantuan flatheads time and again, he only retains fish up to 15 pounds. "Even that," he adds,"is stretching it a little. The smaller fish are great eating, and there are always more than enough of them to go around.'" "Local fishing guide ‘Catdaddy’ talks about targeting paddlefish, shallow catfish during the spring"
"Hammering early-November channel cats with Catdaddy"
"The Great Outdoors: A Fish Tale"
Topeka native enjoys fishing for trophy catfish"
"Catdaddy celebrates 34 years of guiding anglers"
"A Day of Fishing with Catdaddy"
"Unorthodox Tactics for Reservoir Catfish"
"Topeka fisher Catdaddy to compete at nationals"
Cat Daddy Shumway is understandably proud of his family, and especially what he calls "a family tradition of catfishin'." Son of the legend, Catdaddy himself, Brandon spent his childhood fishing lakes and rivers with his family. "Bigfish," a nickname given to him by his father when he was a young teen, while self-explanatory, is something to mention - being known as the one who time and time again, makes the giant catch of the day. 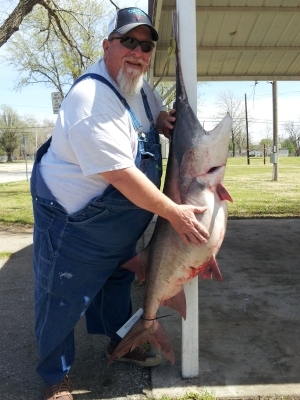 "I just like the anticipation of waiting on a bite and catching a really big fish, but sometimes it doesn't matter how big it is, they're just fun to catch." Watching and learning from his father, what most would call a hobby - turned into passion. Aspiring to join the ranks of legendary fisherman, Brandon has proved to be a prodigy worthy of continuing Catdaddy's legacy. "I have always looked up to my dad and aspired to fish for a living, so it's great to have the opportunity to do both and continue the legacy with my son." The enthusiasm is contagious when the two get to talking about catfishing. Being a fishing guide is about more than just being able to fish all day. The prep-work takes time, having the ability to assess water and weather patterns takes patience, acquiring the knowledge of catfish habit and behavior has taken dedication. It becomes about more than just fishing for them - it's about the clients' experience. "I've caught so many fish throughout my life," says Bigfish,"the real excitement now comes when a client catches their 'big catch'- whether its 5 or 50 pounds; that is why I have grown to love what I do, sharing these experiences with people from all over the country."